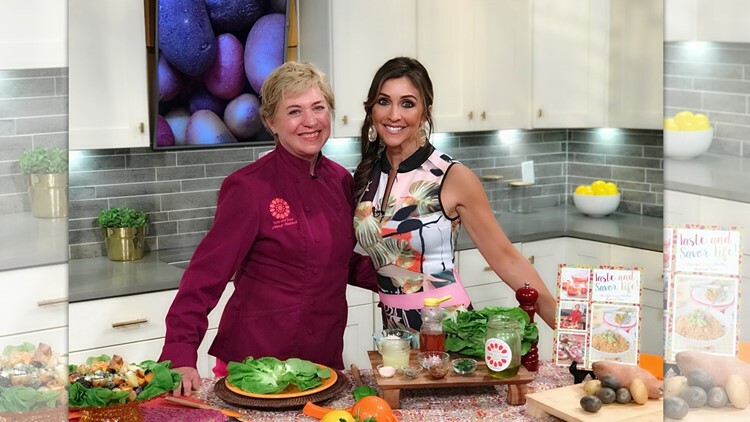 Taste and Savor's Chef Nancy Waldeck shares yummy AND healthy potato-inspired recipes on 'Atlanta & Company'. Check out her fresh ideas below and tag A&C on our Facebook page or tweet/tag @atlandco to be featured! September is not only the time we say goodbye to summer and hello to fall, but a month that’s all about celebrating one of everyone’s favorite foods – the potato! In the United States, far and away our most popular vegetable is the potato, followed by the tomato. (USDA measured consumption by the pound, and potatoes are heavier than kale and lettuce.) Followed by onions, carrots and broccoli. The average American eats about 124 pounds of potatoes per year while Germans eat about twice as much. There are over 400 sweet potato varieties grown from Africa to Asia and almost every country in between. Here in the United States, North Carolina holds the top spot as the grower of the most sweet potatoes. Potato Salad with Lemon Vinaigrette! Preheat oven to 400F. Toss potatoes in oil, season with salt and pepper. Spread evenly on sheet pan and cover with foil. Bake for about 30 minutes. Remove foil and roast 15 minutes more or until tender. Toss with lemon vinaigrette. Make lettuce bed for each portion. Place some potato salad on lettuce and sprinkle with cheese and oregano. 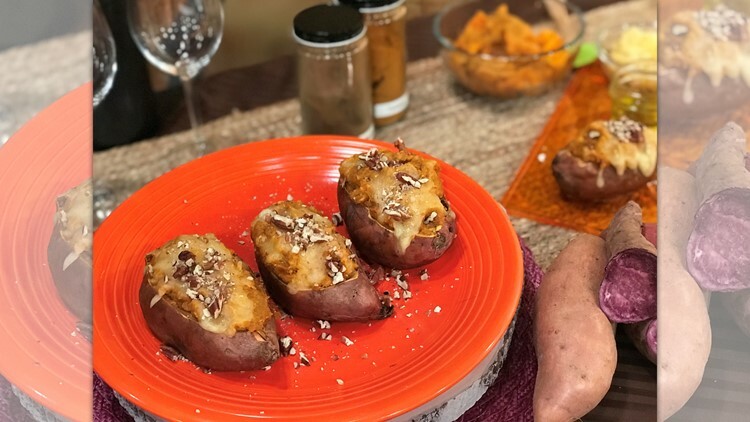 Twice Baked Potatoes – Sweet Potato Style! Preheat oven to 400F. Prick skins of potatoes several times. Roast until soft for about 45 minutes. When cool enough to handle, cut the top third of potatoes off and scoop out flesh into a bowl. Make sure to keep skins intact for stuffing. In a small sauté pan melt, butter and oil together. Mix in spices, salt and pepper and cook until fragrant, then add milk. Pour warm mixture over potatoes and mash thoroughly. Reduce oven to 350F. Spoon potato mixture into empty potato skins. Sprinkle with cheese and bake until thoroughly warm, or about 30minutes. Garnish with nuts. Potatoes with Wine? Of Course! These easy recipes call for a wine that’s just as easy to enjoy. A Torrontes from Argentina is a white you may not have enjoyed before – buts it's a great one to try with a veggie dinner. Lots of peach and melon flavors, a fun change from a white like Pinot Grigio!